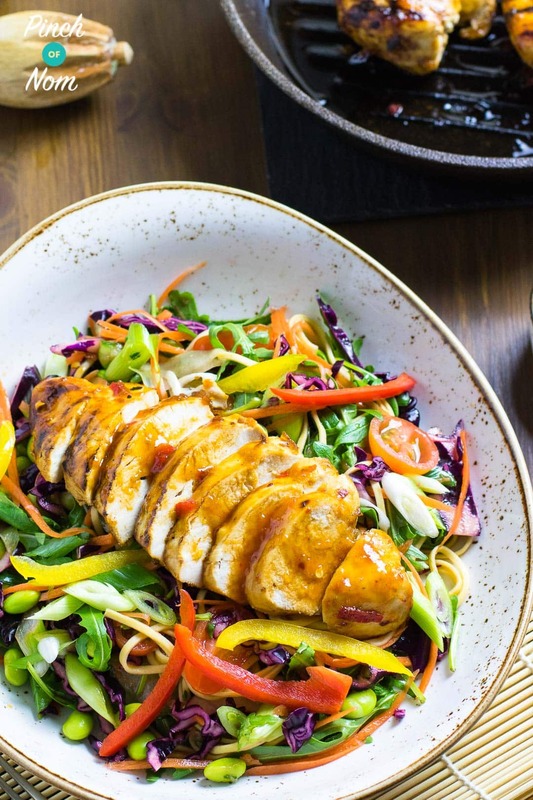 This Sweet Chilli Chicken with Rainbow Salad is a quick and easy meal when counting calories or following plans like Slimming World and Weight Watchers! 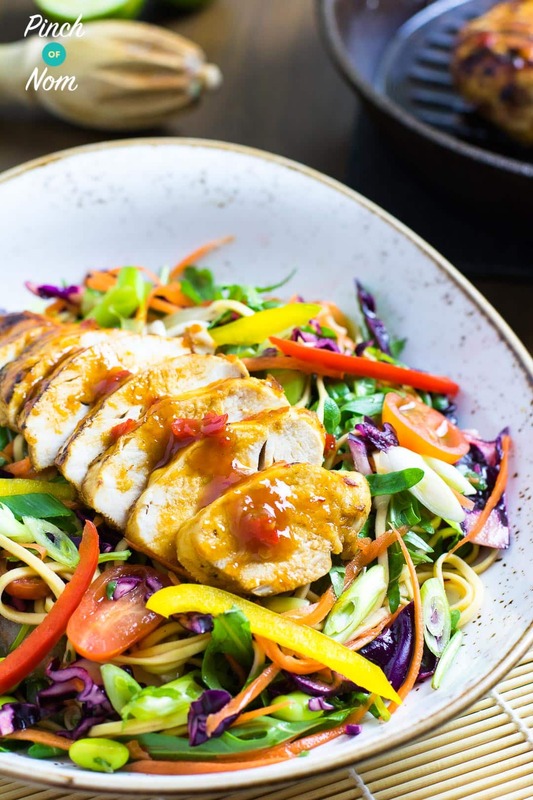 You’ll notice that this Sweet Chilli Chicken with Rainbow Salad recipe uses our Pinch of Nom Sweet Chilli Sauce recipe, which you will find here. 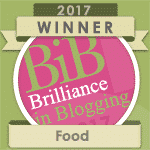 However, you can use a shop bought sauce, but you’ll have to adjust the calories, Syns and Points accordingly, and it won’t be half a nice in our opinion! 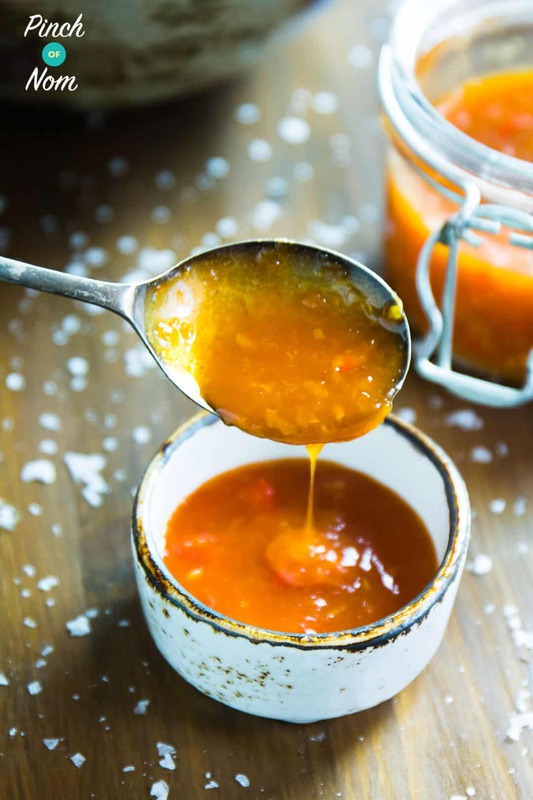 The Sweet Chilli Sauce is one of our easiest recipes and you can make it up in advance and keep it in an airtight jar in the fridge until you’re ready to use it. We’ve stored it this way for over a week without any problems. There are a couple of different ways to cook this Sweet Chilli Chicken with Rainbow Salad. You can follow the method we’ve used here, and use a griddle pan (see below for more details) which will give you those griddle markings. If you don’t have a griddle pan, you can just pop the chicken in the oven for 20 minutes or so. Another option, with the warm weather fast approaching, is to throw it on the BBQ. What else will I need to make this Sweet Chilli Chicken with Rainbow Salad? There are a few things that will make this Sweet Chilli Chicken with Rainbow Salad recipe a little easier to prepare. 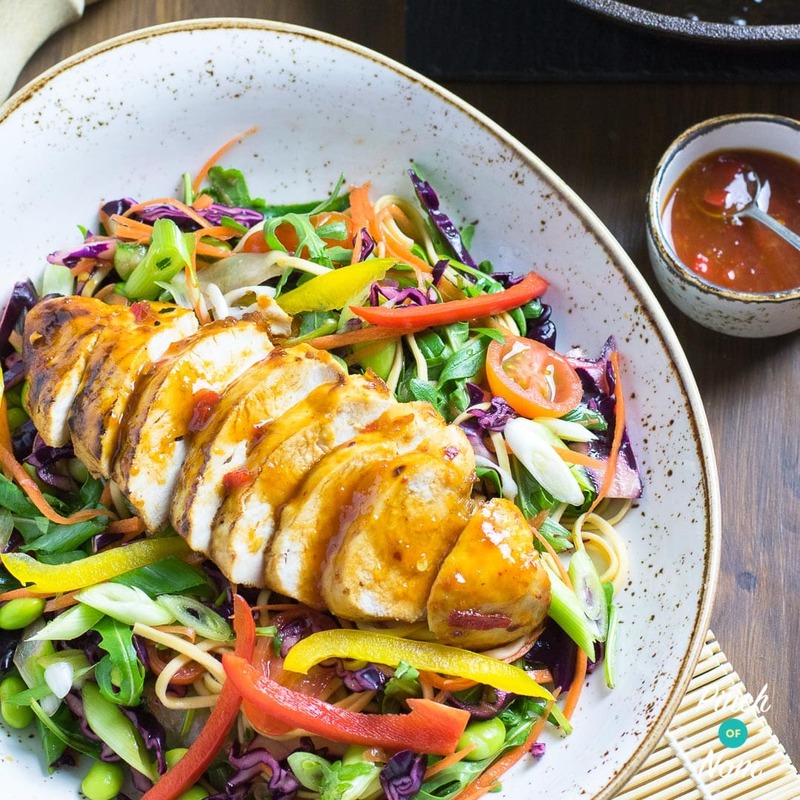 This Sweet Chilli Chicken with Rainbow Salad recipe requires a lot of the ingredients to be cut into thin strips. Now, you can do this with a decent sharp knife, but as you will know we love a kitchen gadget so we like to use either a mandoline or a julienne peeler. If you don’t have either of these you can pick them up on Amazon. 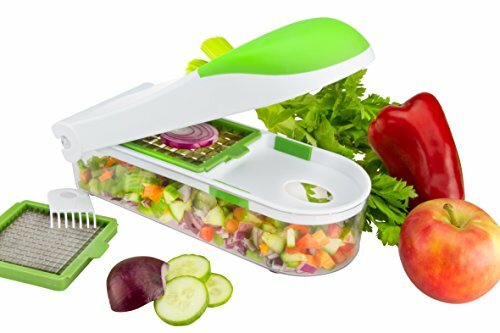 If you want to go for the peeler option then we can’t recommend this Deiss PRO Dual Julienne Peeler & Vegetable Peelerenough. 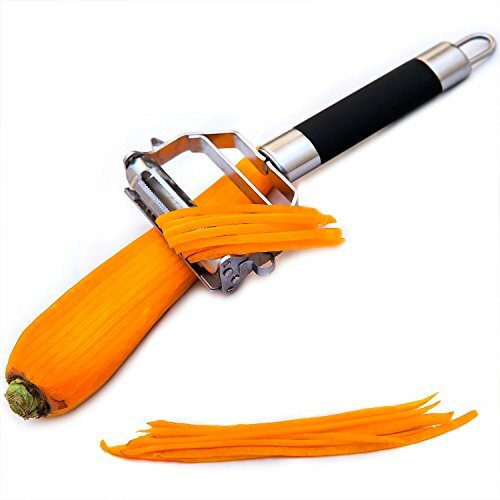 You can use it to julienne the carrots and then flip it over to slice the cucumber into thin ribbons. How good is that! If you’d rather go for the mandolin then we’d recommend this one as it has everything you could possibly need. Lastly the cast iron griddle pan, this has to be the most used pan in our kitchen. 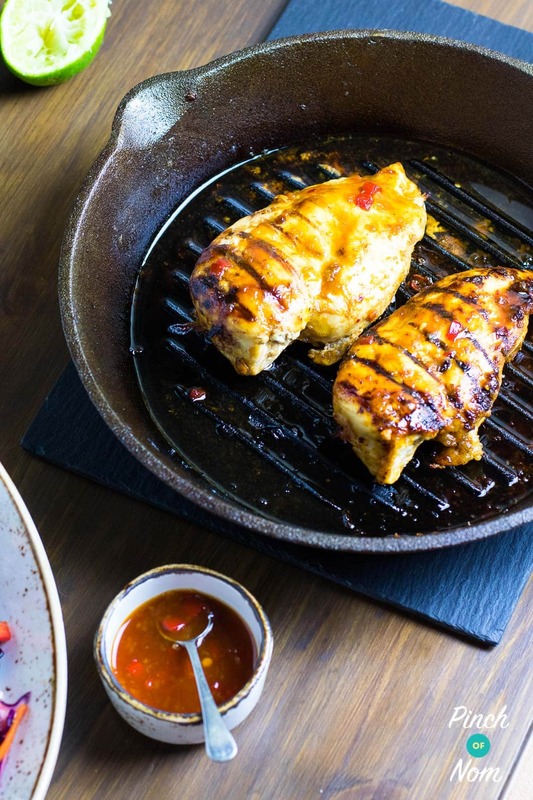 Whilst it’s not essential for this Sweet Chilli Chicken with Rainbow Salad recipe it certainly adds to the flavour as it gives those lovely griddle marks on your meat too. It conducts heat really well, and it’s suitable for all stove surfaces. 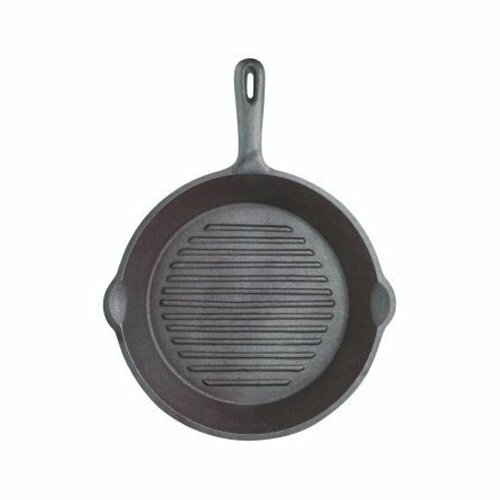 You can get this Kitchen Craft 24 cm Cast Iron Round Ribbed Grill Pan super cheap over on Amazon. It’s the one we have and use many times each week! 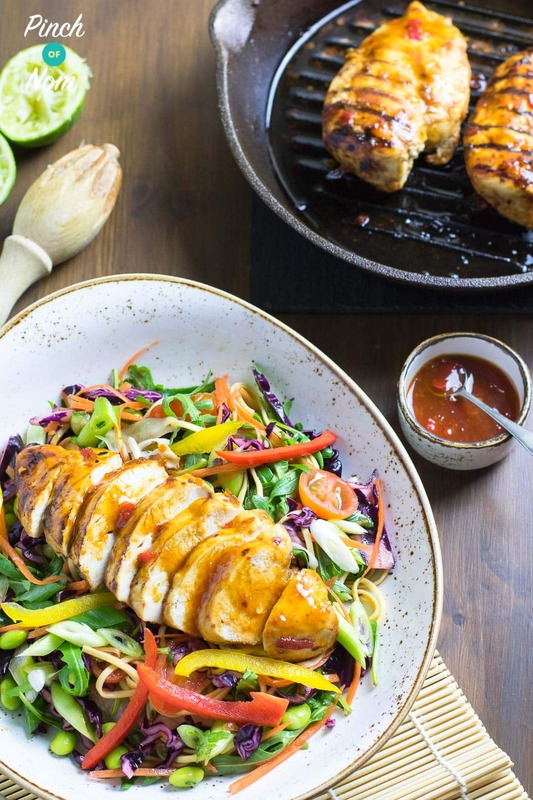 Want to save this Sweet Chilli Chicken with Rainbow Salad for later? Pin it to Pinterest! If you're using a griddle pan, spray it with some Frylight, then place over a moderate heat. When the pan is hot cook the chicken breasts on both sides for a few minutes until they are seared and have the 'grill' markings. Place them in the oven for 15 minutes or so until they are cooked. If you're not using a grill pan just pop it in the oven for 20 minutes or so. 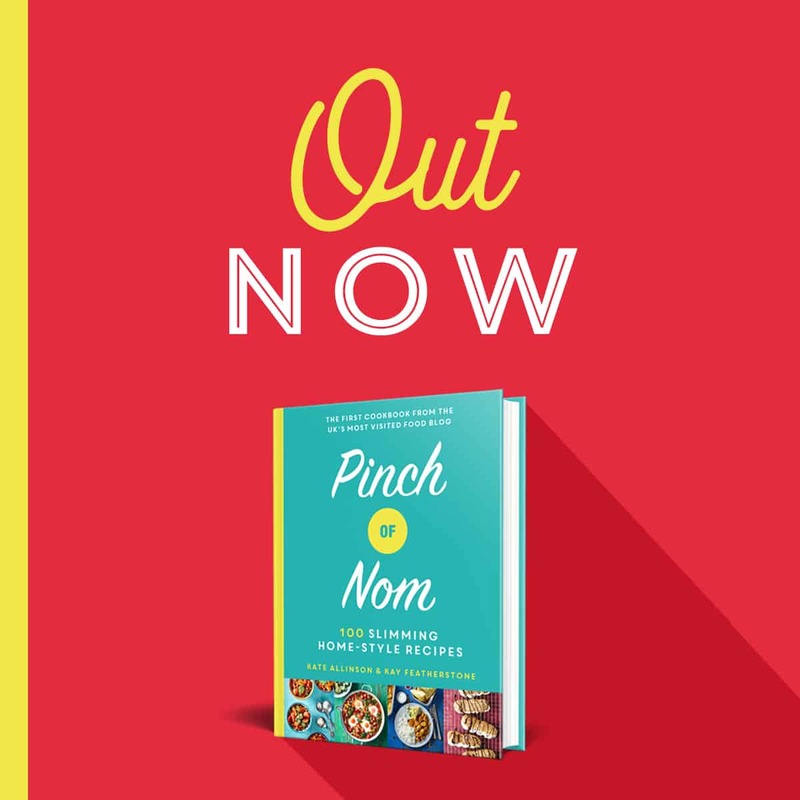 Head over to our website – http://www.pinchofnom.com for all our recipes and articles. 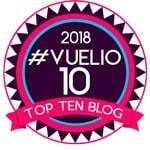 You can also sign up to our weekly newsletter.